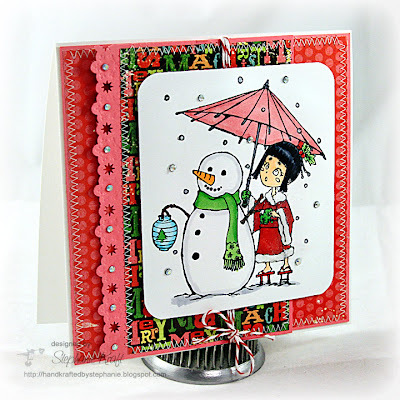 Welcome to the second day of sneak peeks of the September Sparkle Creations Rubber Stamps release! Sparkle is releasing 6 new images at midnight EST this Saturday, October 9.. Today a few of us are showing Rin and Snowman! Be sure to visit Lisa, Simonne and Sparkle for more looks at Rin! I stamped and colored Rin and Snowman with Copic markers. I added some fine glitter around her Santa kimono.. isn't she just the cutest?! Gotta love a girl who will go barefoot in the snow! I paired her with some paper from Echo Park Everybody Loves Christmas. I also added some iridescent rhinestones to the punched border (and to some of the snowflakes around the image). Accessories: Snowflake embossed border punch, Fine glitter (Martha Stewart), Round-It-All (Zutter), Markers (Copic), Divine Twine (Whisker Graphics), 3 mm iridescent rhinestones (Pizzazz Aplenty), Foam tape, Thread, Sewing machine. Gorgeous, Stephanie! Very pretty papers too! Gorgeous design! Love the papers and your coloring is fab!